Anti-racist activists are decrying Canada's fledgling “yellow vest” movement as a rebranded coalition of populist right-wing groups, far-right anti-immigrant groups, and white nationalists. On Saturday, Dec. 15, dozens of yellow vest protests took place in public spaces and town squares across the country. The rallies were organized in a public Facebook group called Yellow Vests Canada, which grew to 60,000 members in the past week. This was the second weekend in a row that yellow vest demonstrations were held nationwide. On social media, organizers crowed about their success, claiming that rallies were held in more than 130 Canadian communities. The yellow vest movement derives its eponymous symbol from populist demonstrations that began in Paris, France, in November of this year. Protesters there, dubbed the “gilets jaune,” rallied on a 25-point platform, which expressed outrage over an increased cost of living, a government-imposed fuel tax (paired with steep tax cuts for the wealthy), and the perceived inequality between the French working class and the nation's financial elites. Those protests have since spread to other Eurozone countries including Portugal, Italy, and Belgium. There have been verified reports of far-right and anti-migrant groups participating in the French protests. Despite this, the coordinating committee behind the mass mobilization is supported by a broad coalition of progressive social democratic and labour interests with a long list of complex socio-political demands. In contrast, the Canadian yellow vest movement has united around issues such as Canada's participation in the UN Compact on Migration; a federal price on carbon pollution; and Motion 103 (M-103), a non-binding Canadian government resolution condemning Islamophobia. FACT CHECK: A Global news report about the rallies erroneously stated in its headline that the Yellow Vests Canada group was rallying in support of French demonstrators. 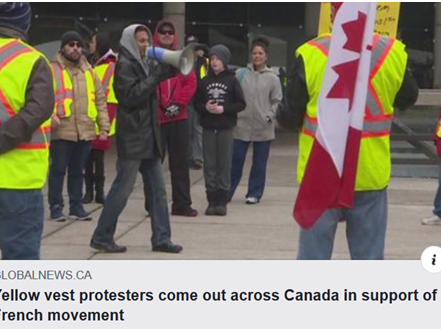 The story has been updated to reflect that Yellow Vests Canada is only inspired by the French protests. Because the French “gilet jaune” movement is aimed at challenging French President Emmanuel Macron, it has also earned support from his opponents, including "populist" right-wing leaders such as U.S. President Donald Trump. In tweets, Trump incorrectly styled the French movement as a fight against environmental legislation, something organizers insist is not true. Italian Deputy Prime Minister Matteo Salvini blamed Macron for the unrest, suggesting French policies on immigration were to blame. On Saturday, Italy faced its own yellow vest demonstrations as people there demonstrated against the country's anti-migrant policies. A press release from the Canadian Anti Hate Network, a nonprofit that seeks to monitor, research, and counter hate groups, shared screenshots of violent threats being made within the Yellow Vests Canada Facebook group. Ricochet has confirmed that such threats were commonplace in the group. Threats were directed towards Canadian politicians, Muslims, Antifa (anti-racist activists), and police. Additionally, commentary that conveyed racist sentiments, including anti-immigrant statements, anti-Semitism, and Islamophobia, was common in the group. Comments on the group included overt anti-Semitism and threats toward Muslims, leftists, politicians and the police. Anti-racist community organizers also claimed on social media that a key administrator of the Yellow Vests Canada Facebook group, a Toronto resident named Tyler (Marc) Malenfant, has been linked to advocacy for white nationalism. Screenshots of conversations in which Malenfant appears to espouse white nationalist views were published in 2015 by Anti-Racist Canada (ARC), a public interest research project monitoring the extreme right in Canada. Malenfant did not respond to requests to clarify his past comments by press time. On Sunday Dec. 16, ARC posted a detailed examination of threatening posts made in the Yellow Vests Canada Facebook group. "Right-wing groups in Canada are appropriating the symbol of the yellow vest without any actual engagement with or understanding of the YVM [yellow vest movement]" said Qaiser Ali, a Toronto-based anti-racist community organizer who wore their own yellow vest to the event to challenge “right-wing appropriation of the symbol.” According to Ali, "the vests are merely an attempt at rebranding." At the rally in Toronto, protesters occupied a Christmas market in the city's central Nathan Phillips Square. For two years, the square has been a frequent setting for tense and dramatic confrontations between far-right anti-immigration demonstrators and their opponents. On Saturday a small group of anti-racist activists faced off peacefully with approximately 30 anti-migrant demonstrators. Chants were hurled back and forth between the groups. Former Toronto mayoral candidate Faith Goldy, an avowed white nationalist, led the far-right group in chants of "What do we want? Nationalism!" and "Canada first!" The rally was joined by nationalists from within the Chinese Canadian community and self-professed Hindu ultranationalists. "See, look, this is diversity," a speaker from the Hindu group RISE Canada said proudly to an associate. The Yellow Vest Canada movement “is unique in that it is bringing together the anti-Muslim, alt-right neo-Nazi and ultra-conservative elements that make up the far-right movement but don't always play nicely together or overlap," said Evan Balgord, executive director of the Canadian Anti-Hate Network. 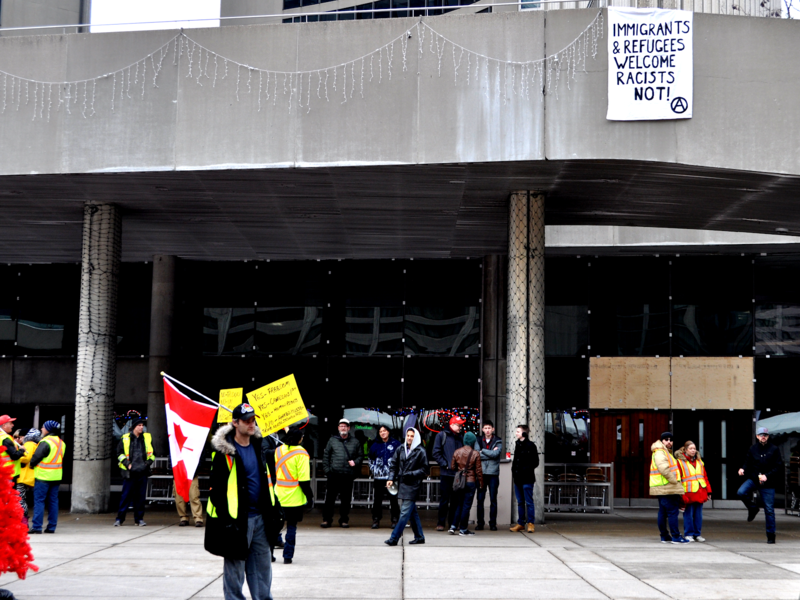 At one point during the Toronto rally, anti-racist protesters unfurled a banner above the yellow vest demonstrators. While police were removing the banner, a demonstrator wearing a yellow vest approached counter-demonstrators and initiated a conversation about anti-Semitic conspiracy theories, suggesting that "Zionist" Jews or "globalists" were responsible for the world's financial problems. While the competing rallies were peaceful, Toronto police confirm that an individual was arrested at the rally. Tweets from yellow vest supporters indicate that the arrestee was an event organizer who was detained by police at the end of the rally. Police clarified to the Toronto Star that the arrest was "unrelated to the protest." In Edmonton, two arrests were reported. Video showing scuffling has been published, but it remains unclear which group the arrested parties belonged to. The appearance of seemingly unified far-right groups criticizing Canada's participation in the UN Compact on Migration mirrors rhetorical positions from both the Conservative Party of Canada headed by Andrew Scheer and the new People’s Party of Canada headed by Maxime Bernier. Posts on social media indicate that some supporters of the Yellow Vests Canada movement believe the Migrant Compact should be a key issue in the upcoming 2019 general election. Sign it if you haven’t yet and RT to make sure it is the most signed e-petition by an even larger margin. We need to keep this issue alive. "This yellow vest movement is bringing together all strains of the far right in Canada and even some new people who maybe aren't all that aware of the kinds of hate groups that underpin the movement, though I'm sure that many of them will realize it before long," said Balgord. For their own part, Ali bemoaned the implications for the broader political context behind the insurgent Yellow Vests Canada movement. "With an election year coming up, anti-Trudeau yellow vest protests are sure to spread across the country, and if those who observe and report on these events are unaware of just who these people are, and how little they have to do with what's going on in Europe, then the misinformation will spread farther and faster than the fact-checking."